Brandi Nell the Southern Belle: From Brassy to Sassy! Whew! What a crazy week! This is my busiest time of year at work and things really won't slow down until November - so please bare with me. I really hope you enjoyed Katie's home makeover last week! It so fun to get a sneak peek into the homes of others - I would love to share yours here as well! Okay - so today's project may not be to every one's taste, but I think it turned out super cute! The hubs and I have been starting to plan the overhaul for what will become my office/sewing/craft area. I am so excited about what we are planning and cannot WAIT to get started on it... but with work being insane, we can't dive in until after September. So, instead - I will begin working on small projects that will go in the room that will make a BIG impact when we finally get to work in there. We knew we wanted to change the light fixture in the room, but with slanted ceilings and two skylights, I was limited in what I could put in the room. I knew I wanted a chandelier or a pendent light - but something unique and fun (in an office/sewing/craft area, I want to be INSPIRED, not bored). 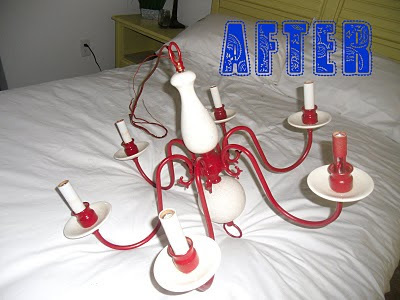 So we found this old brass and ceramic chandelier at Goodwill (for a steal at $11)and decided that we could transform something old and dated into something bold and fabulous. I loved the cracked look of the ceramic and decided to keep it. So we taped everything off that we didn't want painted. 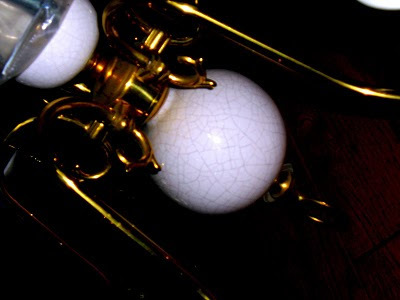 Then we cleaned the brass, lightly sanded the brass, then cleaned it one more time. Once we had a good, clean surface - we began the spray painting... Isn't the bold red so fun? Don't forget to paint the hanging chain! We let the paint dry for 24 hours then removed the tape, and voila! What was Brassy, is now Super Sassy! 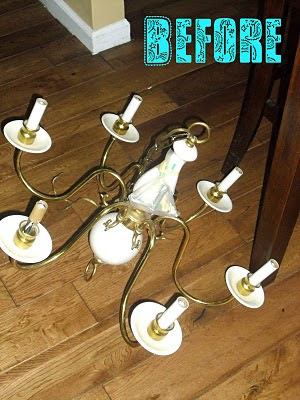 I think this chandy will look fab in my workspace, especially with the Mexican tile floors that are already in there. I still have to find some cute shades and hang her. But that will come in good time! Hope you guys have a fab week! 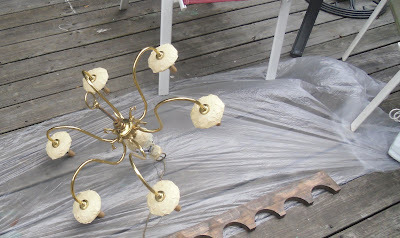 I would love to know what you think about the new Chandelier, so feel free to comment below! And don't forget, if you are working on a project (big or small), I would love to see it or maybe even feature it here. Just send it to me at brandi.wigley@gmail.com. Talk soon, friends! I love it!!! It will be perfect with the Mexican tile that is in there!!! You should do a fun cork board in there too with some red and white fabric over it to tie it all in! we are doing on of our guest bedrooms as an guest room/ office/ craft room! Good luck for when you start redoing the room! Fantastic transformation! 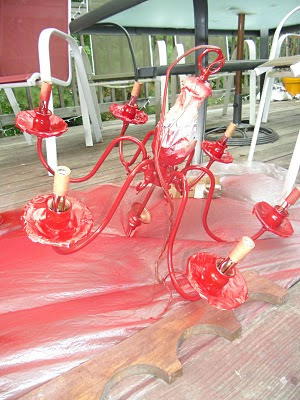 I would never have thought about painting it RED!Can't wait to see it up, it will be a great focal point for sure. I love how you decided NOT to spray the entire light red - makes it more original. I do not know the brand name of the chandy. I tried to find it, but don't see it stamped anywhere. We bought it at Goodwill and of course, it didn't come with any kind of tag to tell me who manufactured it. I know that I have seen similar ones in homes before, but don't really know much about the people who make them. So sorry! I would LOVE to see what you end up doing to it! Make sure to send me pics! Please stop by again soon! I love making new blog friends!